TRIBECA — When Mayor Michael Bloomberg tries to shut down TriBeCa's beloved Hook & Ladder 8 firehouse, who you gonna call? That was the message Friday morning, as more than 100 politicians, firefighters and residents rallied outside the North Moore Street firehouse, which served as fictional headquarters for the paranormal detectives in the "Ghostbusters" movies. "That was a fantasy," Public Advocate Bill de Blasio told the crowd, "and it was all about knowing there were people out there to help you. This is reality. If the mayor has his way, when you place that call, Ladder 8 won't be there to help you." Bloomberg plans to close 20 fire companies around the city to save money, including two in lower Manhattan: Ladder 8 in TriBeCa and Ladder 4 on South Street in the Financial District. The City Council and the mayor must come to a final agreement on the budget before the end of June, so time is running out to save the companies, activists said. Actor Steve Buscemi, who worked as a firefighter before starring on "The Sopranos," urged people to take action immediately. "They've always helped us," Buscemi said of the endangered fire companies. "Now they need our help. Call 311. Stand up for your community." As if to highlight the need, an alarm sounded inside the firehouse, and the crowd outside scattered to make way for the ladder truck as it pulled out. "Save Ladder 8! Save Ladder 8!" people chanted, bursting into applause as the truck sped down Varick Street, siren wailing. Diane Lapson, president of the Independence Plaza North Tenant Association, said that when she moved to TriBeCa in the 1970s, there were no schools, no grocery stores and no luxury high-rise condos — but at least she had a firehouse. Since then, the neighborhood has grown tremendously, funneling far more tax dollars to city government and clearly supporting the need for fire protection. "I think you're nuts, Mayor Bloomberg," Lapson said. Other residents recalled Ladder 8 responding to small fires and sundry neighborhood emergencies. Parents said their children loved meeting the friendly firefighters and gawking at the big red trucks as they drove past. 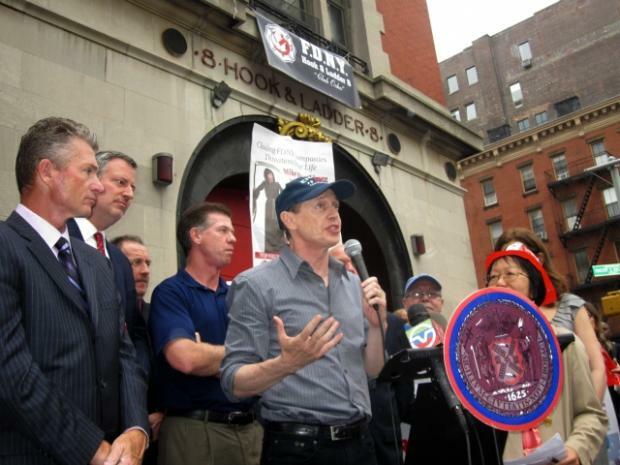 Before the rally, which was organized by City Councilwoman Margaret Chin, FDNY Lt. Brian Forsyth, 44, who has been working at Ladder 8 for six years, said the proposed closures are demoralizing firefighters and endangering the public. "It's insane," Forsyth said. "They're playing Russian roulette with the lives of the people of the city of New York. I'm just in shock. I don't understand."